It’s always encouraging to see new clubs joining the British baseball leagues. One of the new entrants to the BBF in 2017 are Norwich Iceni, particularly exciting for me as they are based in my home city. As shown by BaseballSoftballUK’s Team Finder map, the area has a number of softball teams as part of the Norfolk Softball Association, but there’s plenty of space for baseball too. The two nearest baseball blue flags belong to the Cambridge Royals/ Monarchs in Cambridgeshire, who brought baseball back to the city in 2011, and the Haverhill Blackjacks in Suffolk. 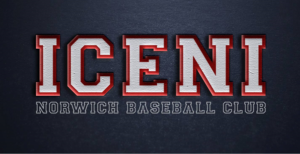 Norwich Iceni will be the first league team in the city since the Norwich Wanderers of the early 1990s, joining the UEA (University of East Anglia) Blue Sox who compete in the university leagues. UEA, alongside Nottingham and Southampton, were one of the key places that helped get the University Baseball scene up and running again 10 years or so ago, and UEA graduates are part of the group that have formed Norwich Iceni. Thanks to the Iceni club being born, a local newspaper clip was uncovered and published on their website about the Norwich Wanderers being founded in 1991. It explains that the team was formed in 1991 and that, as known at the time (and yet to be disproved) they were the first baseball team in the city’s history (outside of the UEA team). The team was based in Heartsease, an estate to the north-east of the city centre, and the article includes several photos of the team, showing their red and white uniform. Inspired by the newspaper clip and Norwich Iceni’s 2017 debut this coming Sunday, I’ve undertaken some research in the records we have digitised and available online as part of Project Cobb to put together what we know about the Norwich Wanderers. If you have any further details, please do get in contact. Norwich Wanderers were formed in 1991. Whether they played in a league in their debut year, or played friendly games as and when they could, is not confirmed. The newspaper article states that they were expecting to play Mildenhall in 1991 and the Old Timers website notes that they played Norwich in this period so it’s possible they had a game or two that year. Norwich competed in a BBF Anglia League alongside Bury Saints B, Stevenage Knights, Tiptree Hotsports Rays and UEA Anglians. The UEA Anglians were part of the university in Norwich and the press article states that the UEA had been running a baseball team for a couple of years prior to the Wanderers starting out in 1991. The press article also shows an interesting link with Tiptree Hotsports Rays. Norwich were able to gain sponsorship from the local Hot Sports shop and so presumably the branch in Tiptree supported their local team for several years too. Further details about the 1992 season have not been uncovered to this point. If you can fill in any blanks, please get in contact. The season started on 9 May and Norwich took an 18-14 defeat at the hands of Nottingham, with Newark Giants crushing Derby 44-2 (no ‘mercy’ rules in effect in this league, by the looks of it!). One week later and Norwich took another loss, this time a heart-breaker against those Newark Giants. Newark got a 26-25 walk-off victory to send the Wanderers to an 0-2 start. By 13 June Norwich had a 1-2 record, with the other results recorded and league table showing that the win must have come against either Derby or Long Eaton. However, that’s where the Brit-Ball records end. A league table and results from the Midlands League are conspicuous by their absence from August onwards and the record of 1993 champions in Issue 7 doesn’t include a winner from the Midlands League. That would all suggest that the League petered out for some reason during the course of the season and wasn’t completed. The regular season standings were split into a North and South league, with Norwich being in the North, although teams faced each other over the two leagues. Thanks to the Brit-Ball records, we’re able to piece together Norwich’s entire season, with just one educated guess along the way. Norwich started off their season on 8 May with a 24-14 victory over Fulham before splitting a double-header with Milton Keynes on 15 May. A comfortable 29-0 win over Waltham Abbey on 22 May gave the Wanderers a 3-1 start to the season before a rest weekend for the Spring Bank Holiday. Norwich resumed their campaign on 5 June. Comparing against the published standings shows that they must have lost that day. The Brit-Ball records don’t show that result but they do show part of a 9-0 victory for Milton Keynes (presumably a forfeit) with their opponent obscured by the way the page has been scanned. It’s likely, if not 100% certain, that it was Norwich who forfeited that game. The Wanderers then won six games in a row before facing off once again against Milton Keynes on 31 July. The Truckers won 13-4 and, with a couple of assumptions built in (the possible earlier forfeit loss to MK and guessing the likely tie-breaker), that would prove decisive in terms of splitting the teams in the final standings. Norwich were handed a forfeit win on 7 August against Waltham Abbey and then edged a one-run contest with Brighton (17-16) on 14 August to put them on an 11-3 record for the season to that point. A chastening 30-1 loss at the hands of Burgess Hill followed on 21 August and that proved to be Norwich’s last action of the season, as their final game against Guildford was forfeited by their opponents. That all meant that Norwich had compiled a 12-4 record; however during the course of the season Cambridge Fellows and Eastbourne Aces withdrew from the league and results against those teams were removed from the standings. Three of Norwich’s wins came against Cambridge (two by way of forfeit) so their record in the final standings was 9-4 (Norwich didn’t play against Eastbourne). Norwich ended the season with the same record as Milton Keynes, but the Truckers were crowned as the North division champions, with Norwich in second place. Burgress Hill won the South division, with Brighton coming second. Issue 16 (July/August) of Brit-Ball includes batting and pitching leaders and there are three Norwich names in there: Wightman and Bond on the batting side, and Nock on the pitching side. Listed below are Norwich’s full results and the final standings. Norwich Wanderers were listed as being entrants in the BBF South – Division Two North league for 1995 in the March 1995 edition of Brit-Ball, showing that there finish in 1994 was enough to earn them promotion. However the standings for the league in future editions do not include the Wanderers. It would seem that they were unable to get a team together for that year, and so didn’t take to the field, and that is where the Wanderers’ story comes to an end. Back in November 2008, an article here on BaseballGB about Southern top-tier baseball prompted Herts Baseball’s Paul Auchterlounie to pass on some anecdotes and details from his time in Norwich in the comments section. Paul joined the Wanderers in 1994 and confirmed that after that season “the departure of several key players (some of whom were US forces personnel)” resulted in the club folding, although he also noted that some social baseball / softball continued for a few years afterwards. “Matt – I was interested to read where you live. I’m from Norwich originally and indeed that is where I first started playing baseball. Having picked up the game whilst in the States on a uni exchange program, I returned to Norwich and found out there was a team – Norwich Wanderers. I joined up and had a mediocre start to the game, competing in the then division 3 south (I think) within the BBF. The diamond was on a council field in the Heartsease estate – behind three tall tower blocks. I have no idea whether it’s still there or not (chances are probably not). One thing I do remember about the diamond is this (it seemed quite funny at the time, but wasn’t when you look back on it): There was a car park around the back of one of the tower blocks. This would be so far into foul territory down the left field line as to be out of sight, and almost in line with where our HR line was. Also – we had a quite incredible 3rd baseman. Nicknamed Hoover – cos he seemed to field absolutely everything that came his way. Worked on the farms, so was built like the proverbial brick out house and had a bullet of an arm (still don’t think I’ve seen one as good). I was playing 1st base in a training session, and he picked one up to fire over to 1st. I just put my glove out and prayed he’d hit it cos it was travelling about 8 inches above the ground at about 90 mph!!!! The Heartsease diamond is long gone, although baseball and softball has continued to be played intermittently on Eaton Park over the years. Indeed, that’s where Norwich Iceni trained last year. 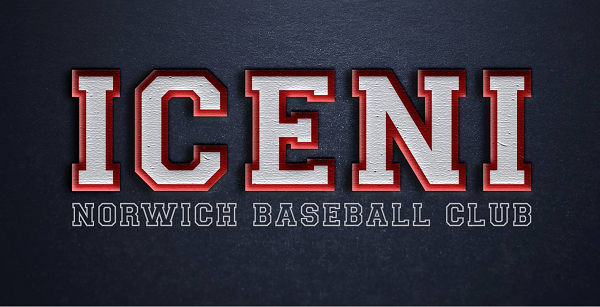 Norwich Iceni are now writing a new chapter in the baseball history of the city. The team will be based at Locksley School, just to the south of the city centre. It’s possible there will be a home for the team on the university site in the future. Norwich Rugby Club are selling up their current land to housing developers and hope to move to a new sports facility at the UEA. The potential impact on wildlife on the site has prompted plenty of controversy locally and although planning permission was granted in November last year, this decision reportedly is now out for judicial review. If the move does go ahead, the current plans include space for a baseball field, albeit one that will cut across football, cricket and training areas (see the site plan at the bottom of this Eastern Daily Press news article). If you’re wondering where the Iceni name comes from, it was the name given to the Celtic tribe that settled in what is now Norfolk (plus parts of north-western Suffolk and eastern Cambridgeshire) in the Late Iron Age. It’s a common name for clubs and organisations in the county (and also a Wetherspoons pub!) and makes for a unique nickname in the British baseball leagues. Norwich Iceni’s first BBF game takes place on Sunday (23rd) at home against Kent Mariners. Further info about the club can be found on their website, http://www.norwichbaseball.co.uk/, and related social media accounts. Here’s hoping it’s the start of a successful new club in British baseball and one that will bring the sport to Norwich for years to come. Hi Matt, Mike Smith here from Norwich Iceni. Excellent research and a fantastic article. Since the four of us got together to throw a baseball around at the first Iceni ‘training session’ in the summer of 2015, I’ve had a couple of brief attempts to investigate the history of baseball in Norwich but never found much so it was great to find out so much here. Our aim is build a sustainable club in Norwich to provide an opportunity for people to play baseball for many years to come. If any past Wanderers want to get in touch with us through our website or social media, we’d love to hear more stories about Norwich baseball! Hi all my name is mark and I had great pleasure in reading about Norwich wanderers. I was there with the boys when the ball was slugged into the car park, the mans name who was responsible was big rob . Huge great thing he was and he was also a trained umpire. As for the Hoover it was my mate niel bond built like a ring . Other names I remember are . Danny a drum teacher. Kevin schwants.warren niel bond and his brother. Big rob pitcher Paul..I can remember faces but I can’t put names to them . And finally Paul if you read.this I married Aston from Norwich belters and the hart seas mound is still in operation as I have recently used it as part of a sport leaders qual . I have recently joined iceni and hope to play competitive hard ball perhaps in an old timers game … Mark. East all .